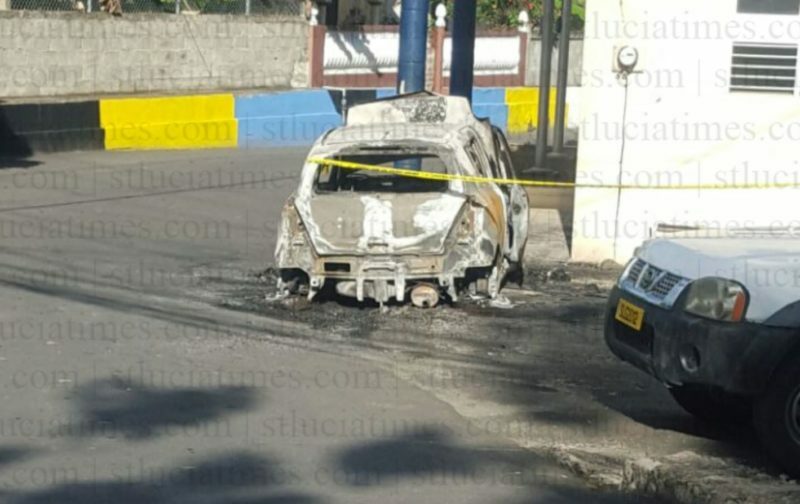 A private car belonging to a police officer was destroyed by fire, it has been reported. The vehicle had been parked outside the Canaries police station, a law enforcement official told St Lucia Times. According to the official, the incident occurred Sunday morning after 2.AM. “Based on where the vehicle was parked, the officer was not able to see it,” it was explained. The law enforcement official said that the incident is being treated as a case of arson. A video, purportedly of the vehicle on fire, was posted on social media. On what basis are they treating it as arson? All the reason why around police stations and other important buildings should have camers. That would have probably helped. A segment of St. Lucian society has gone mad. Get rid of indolent Minister of National Security and replace him with someone more aggressive, energetic, thoughtful and courageous. Under his short tenure at this most important ministry, the crime rate has reached unprecedented heights. It’s patently clear that the man is supremely unfit for the job. St. Lucia is descending into a failed state where criminals commit horrendous crimes with impunity, where the health system is in an unhealthy mess., where unemployment is staggeringly enormous, where the government jeopardizes hard working civil servants job security, where people are at the end of their emotional and mental limitations. It’s just a sorry state of affairs right now overwhelming the population. Those at the helm need to do much better. Hopelessness is gripping the island. Imagine if it is in fact arson. Right there inches away from a police station. How will ever have confidence in those dolts to protect us. Were the police sleeping? Life is too easy for the police.